Poland’s economic performance surprised even the most seasoned watchers with actual growth beating all forecasts. With five consecutive quarters of growth over 5% (from Q3 ’17 to Q3 ’18 inclusive) Poland’s run of strong macroeconomic results hasn’t yet run out of steam. It has just passed the peak of its current economic cycle, with year-on-year GDP growth slowing to 4.9% in Q4 2018. Growth this year is expected to be somewhat slower than in 2017 and ‘18, with forecasts ranging between 3.5% and 4.0%. Again, as happened last year, each successive forecast tends to nudge upwards. Last week, for example, Fitch raised its forecast from 3.8% to 4.0%. Worsening trading conditions in Germany, Poland’s number one export market, and the threat of a no-deal Brexit affecting Poland’s number three export market, is likely to negatively impact industrial production. However, Poland’s economy has three stout legs; when one weakens the other two – infrastructure investment (largely EU-funded) and consumer spending – will keep the motors running. Registered unemployment has risen from a record low of 5.7% in November 2018 to 6.1% in February 2019 – ostensibly a seasonal effect. Yet the Eurostat measure, looking at economic activity rather than the claimant rate, was 3.7% in January 2019, suggesting that well over a third of those registered as unemployed are working in the cash-in-hand sector. Concerted efforts by the Ministry of Finance to close down VAT loopholes (which resulted in 53.4 billion zlotys of foregone revenue in 2015) are proving effective. Deputy premier (now premier) Mateusz Morawiecki claimed to have clawed back some 15-17 billion złotys in 2016. Further tightening of measures against the grey economy have since been introduced; micro-businesses are now obliged to file their VAT returns online in the Single Audit File for Tax (SAF-T) format. Voluntary split-payment of VAT was introduced on 1 July (for B2B transactions only), causing concern about the liquidity of small businesses whose cash-flow will be affected, and real-time reporting via online fiscal registers will come into force this year for the automotive sector (petrol stations garages, car-washes, tyre repairers etc), to be followed by hairdressers, beauty salons and nail bars. This process will continue into 2023 with the food retailing sector (largely well-behaved in fiscal terms) being the last to have to comply. Concerns about the effects of political interference in the markets remain present among foreign investors. The law restricting Sunday trading, which comes in force in steps (from two Sundays a month in March 2018 now to three Sundays a month from January 2019, the last Sunday being open for business). In the pharmaceutical sector, there proposals to limit advertising and selling OTC remedies. The construction sector still has issues with ease of obtaining planning permissions and poor public procurement procedures. An increasing worry among foreign investors regarding the independence of the Polish judiciary concerns the legal fair play in cases where they may be facing the Polish state or state-owned enterprise in court. This is not a major worry for foreign investors who have come to Poland to make car parts or process food, where the client/customer is in the private sector. But foreign-owned construction firms engaged in major infrastructure projects for the Polish state are concerned that court cases between them and the public-sector contractor might not be fairly adjudicated. There is a feeling that courts where the judges take instruction from politicians will be biased against foreign capital; this will dissuade foreign-owned companies from taking on public tenders and leaving them to Polish firms. With less competition on the market, the Polish taxpayer may end up paying more for infrastructure projects of lower quality. Remaining sectors of the economy, however, feel generally untroubled by political risk, and inward investment from the UK looks likely to rise as investors seek a high-skilled but lower-cost labour force within the EU. BPCC members in sectors such as HR and real estate report rising interest among UK-based businesses with US, Japanese or Indian capital looking for a secure base within the EU. Brexit-related worries are also prompting British businesses to consider Poland as a location for continental EU markets. Questions that investors will be looking at closely: will the 2019 budget be able to withstand the higher social costs of the 500+ child-benefits programme, a lower retirement age and new pre-election social giveaways? Will the prime minister’s plans to simplify bureaucratic procedures for small business boost growth and counterbalance the additional social costs? Will the impending departure from the single European market of what was once Poland’s second-largest export destination hit its industrial production and GDP? Will the Ministry of Digital Affairs be able to deliver an ambitious e-administration project? Looking ahead for the next 15-20 years, Poland will only continue to grow at a faster pace than Western Europe if it innovates; to do so effectively, Poland needs to reform its education system (from primary to tertiary) and build an eco-system that encourages entrepreneurship, investment in innovation and strong links between academia and business. Manufacturing output bounced back from a low in the autumn of 2016; mainly driven by exports. But being Germany’s manufacturing outsourcing backyard, Poland’s industrial production is heavily dependent on Germany's export-led economy. Germany now accounts for 28% of all Polish exports; there are concerns that protectionist tendencies in the US and around the world will slow down the growth of German exports – and the Polish components that feed into it. At the same time, eurozone growth is slowing noticeably. Trade figures for the first half of 2018 showed that Poland's long-running but wafer-thin trade surplus has evaporated, turned to a €1.2 billion trade deficit as import growth finally outstripped export growth (driven by consumer spending and investment goods). Although Poland’s two-and-half-year deflationary run ended in December 2016, inflation has held remarkably steady with consumer prices rising between 1% and 2.2% since (1.2% in February 2019). Wages, however, had been rising faster, with 7.6% growth in the private sector pay in the year to February 2019. The statutory minimum wage increased by 7.1% on 1 January 2019 (from 2,100 zł to 2,250 zł). It is interesting to note that persistent and high wage increases have not yet worked their way into the consumer price index. The Monetary Policy Council cycle of loosening money supply by lowering base rates from a high of 4.75% (May 2012) began in November 2012 with four consecutive 25 bp cuts, followed by a 50 bp cut in March 2013 and a further three 25bp cuts in May, June and July 2013, in response to weakening inflationary pressure. After three months of negative inflation, the MPC made a 50 bp cut in October 2014. The most recent cut was announced on 5 March 2015, and base rates have stayed at 1.5% since. Analysts are not expecting an upward move this year. Poland’s largest age cohort, born in 1983, will reach the age of 36 this year (all 690,000 of them); this is Poland's demographic high-water mark. By contrast, the number of 16-year-olds, born in 2003, is a mere 350,000, the low-water mark. Over the next several years, the number of young people entering the labour market will continue to fall by an average of 17,000 a year, as it has done for the past decade or so. The turnaround will happen when the 2004 cohort starts joining the labour market between 2023-27. However, the high quality of secondary education in Poland continues to encourage the BPO sector to invest in service centres in Poland, as does the high level of foreign language proficiency among younger Poles (Poland was ranked 13th out of 88 countries around the world in the 2018 English Proficiency Index by language training company EF, with ‘high’ proficiency – a level above that found in Switzerland or Czechia). The shock to national accounts of large numbers of post-war baby-boomers hitting pensionable age in the early part of the next decade (65-year-olds born after 1953) will be made worse by the low number of Poles of pre-pension age in the labour market. Only 46% of Poland’s 55-64s are economically active (compared to 63% in the UK). The Tusk government raised the retirement age to 67 for men and women, though the current government has pledged to return it to the previous 65 for men and 60 for women. During the four and half years from February 2004 to October 2008, registered unemployment in Poland fell faster than in any major economy ever in peacetime, from 20.4% to 8.8%. This level was unsurpassed until June 2016. The global financial crisis might not have pushed Poland into recession, but the economy certainly felt the strain. By March 2013, unemployment had reached 14.3%, a new high-water mark, before starting to fall, down to 5.7% in November 2018, rising seasonally to 6.1% in January 2019. Eurostat's May 2018 figures marked the historic moment, when, on a like-for-like measure, unemployment in Poland actually fell below that in the UK, and since then it’s stayed that way. 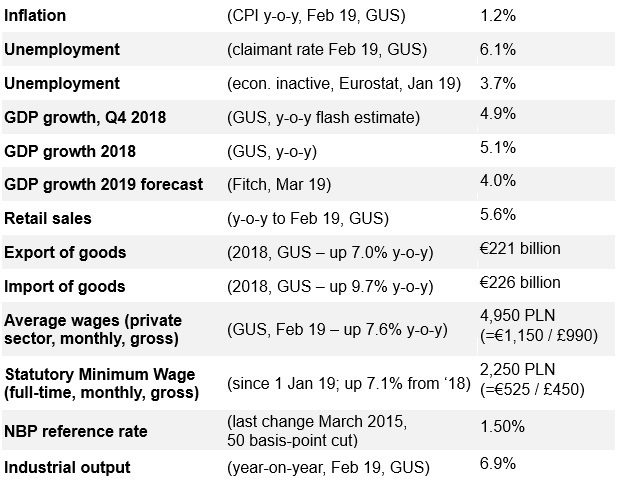 However, Eurostat says that Poland's unemployment, measured by economic activity rather than registered joblessness, stands at 3.7% (January 2019), suggesting that a over third of those signed on are actually economically active working cash-in-hand within the grey sector. By signing on as unemployed, and therefore being without income, they are eligible for free healthcare and social housing. The difference between measures in Poland is 2.4 percentage points; in the UK it is 0.1 percentage point! Compared to the situation in the UK, western Europe and the USA, Poland's unemployment is lowest in the cities and highest in rural areas, with more than half of the long-term unemployed living in villages. There remain massive regional disparities between cities where unemployment is very low (Poznań 1.3%, Warsaw 1.5%, Katowice 1.7%, Wrocław 1.9%, Kraków 2.4%, Gdansk 2.7% in February 2019) while in many small provincial towns it remains stubbornly in double digits. Szydłowiec, some 120km south of Warsaw, also in the Mazowsze province, holds the record at 24.8.%. Nearby Radom, a city of 200,000 people, also has high unemployment at 12.1%. Fruit-growing Grójec poviat south of Warsaw has just 2.3% unemployment (in February! ), reflecting the difficulties that employers have in finding fruit pickers – in the autumn of 2018 it was just 1.9%. Regional differences in unemployment will play in important role in the government's new industrial strategy, in which investment will be directed by subsidies and tax incentives towards areas of higher unemployment. Investors might wish to consider university cities such as Kielce, Lublin or Łódź, where unemployment stands at 5.6% (data from February 2019). Since February 2009, the zloty climbed back, though not to the unsustainable level of 3.20 zł = € experienced in August 2008. Throughout 2010 and into 2011 the zloty held steady at around the 4.00=€ and 4.50=£ marks. The euro crisis, however, have knocked the steam out of the zloty's stability. The wobbles on the markets caused by the threat of sovereign defaults in the eurozone and Hungary hit the zloty, knocking it back to 4.50=€ and 5.45=£. For much of 2012, however, the zloty has rebounded somewhat, stabilising at around 4.20=€ and 5.00=£ throughout 2013 and much of 2014. The Ukraine crisis barely affected the zloty's stability vis-a-vis the euro. However, uncertainty as to the economic decisions being made by the new PiS government weakened market sentiment towards the zloty, which reached a low point of 6.09 against sterling in early November 2015. But then the Brexit referendum resulted in a dramatic fall in value of the pound. From June to October 2016 5.60 zł, to pound fell to 4.80zł, a 14% drop. This badly hit the margins of Polish exporters. The euro has held stable around 4.30 złotys, while the pound, subject to stronger fluctuations for political reasons, has returned to around the 5zł mark. Trade between the two countries has been grown consistently since the end of communism, accelerating significantly since Poland joined the EU. However, the prospect of a hard Brexit, however, slowed down trade growth in 2018, which turned out to be a record year for British-Polish bilateral trade. The value of trade in goods was £15.8 billion, over five times as much as before Poland’s EU accession. Last year, UK exports to Poland were worth a record £5.1 billion (up from £5.0 billion in 2017) while Polish exports were up to a record £10.7 billion (up from £10.5 billion in 2017). However, this is UK data in sterling. Poland has a large overall trade surplus with the UK (in 2018 it was €8.2 billion – only with Germany does it have a larger one, at €11.6 billion). The value of bilateral trade between Poland and Czechia exceeded that with the UK in 2018, pushing the UK down to third place from second. (Positions were reversed in January 2019 – anecdotally, this may be down to the UK supply chains’ stockpiling) Meanwhile the UK has slipped from eighth to 11th place in the ranking of Poland’s import sources; it remains Poland’s seventh-largest bilateral trading partner (after Germany, China, Czechia, France, Italy and Russia).